Dovetail sawing practice production line: crosscut station, shooting station, and dovetail sawing station. No, this isn't some Roger Corman horror flick. It's a sawing exercise for developing precise control. Nor is it anything new. Many instructors recommend some form of it. In this exercise, you make a number of repeated rip cuts to marked lines in the end of a practice board. Then you cut them all off and do a new set. 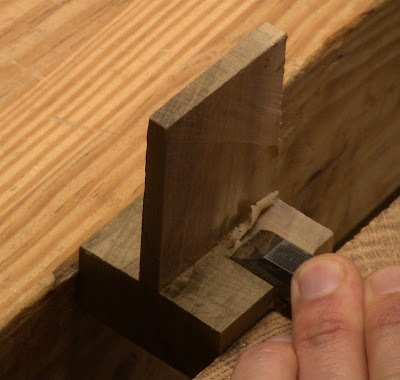 This repetition will improve your dovetail sawing. The goal is to hit the lines perfectly on a consistent basis. 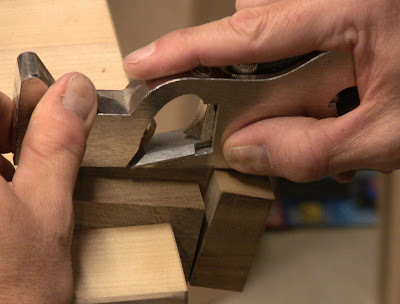 Precise sawing is the secret to dovetails that fit well. Square across and square down. Angled across to the left and square down. Angled across to the right and square down. Square across and angled down to the left. Square across and angled down to the right. 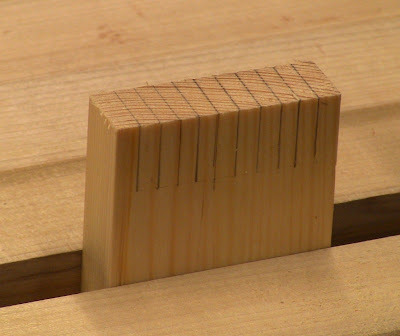 The first one is a simple starter, what you would use when cutting tenons to width. 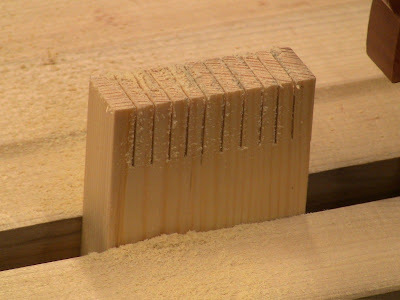 The remainder are the four cuts that form dovetail pins and tails. 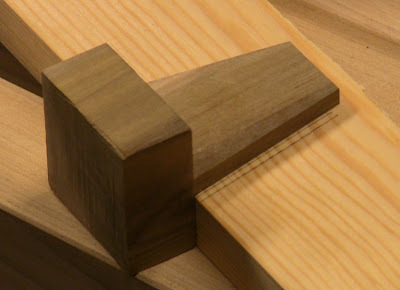 Every dovetail cut is square in one axis and angled in another. Because you stand and sight along one side of the saw or the other, it's a bit different cutting to the right vs. cutting to the left. If you make 10 cuts in each orientation, then repeat the whole set, that's 100 cuts total. It'll take about 2 hours to mark and cut these, but you should find your sawing accuracy improving rapidly. Don't have 2 hours? Just do 50 cuts. If you repeat this every month or so, that'll be a year of 1000 cuts! Think your skill will improve if you do something 1000 times? I do. It's just like a guitarist or pianist or violinist who develops the dexterity to hit the right notes all the time through repeated practice. It's worth varying the species of wood you practice with each time. The cutting characteristics of each will be a bit different, affecting your control. 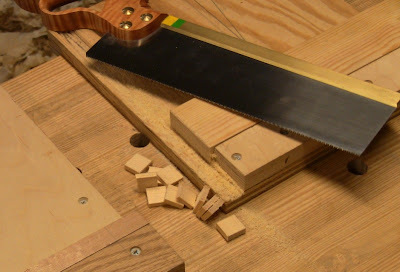 You'll want to use your best dovetail saw for this, and it should be sharp. Saw's not sharp? Take the time now to sharpen it. 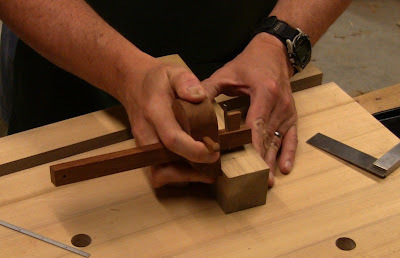 If you don't have a saw vise, you can read about making one in this post, which also includes links to Tom Lie-Nielsen's videos on sharpening joinery saws. 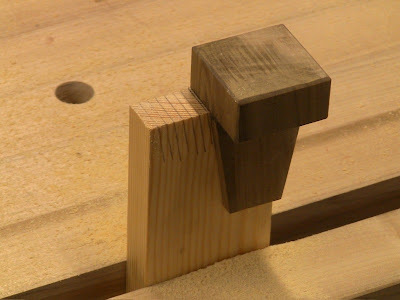 It's also worth using a dovetail marker. For a while I resisted using one. "Dovetail marker? I don't need no stinking dovetail marker!" Until I decided to make dozens of cuts. A marker speeds up the layout significantly. Here's my slight variation of Christian Becksvoort's marker. It's a 1:6 pitch, which is 10 degrees. Feel free to vary that or make multiple markers. I used poplar. Start with a block squared up 1 3/4" on each side, at least 3" long. And I mean sides squared to each other as perfectly as your skills will allow. 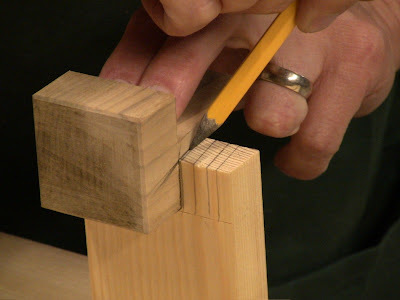 This is where you can loosen the leash on your perfectionist side, because a poor marker will result in poor dovetails. Square a line around 3/4" from the end; this will be the top. The blade of the marker is basically a thin tenon. 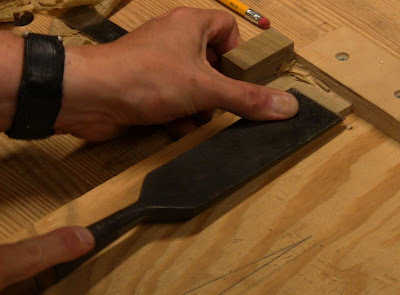 Using a cutting gauge set at 3/4" to mark down the sides of the blade from each side, front and back. That leaves a 1/4"-thick blade. Sawing down the shoulders to the blade after trimming to 3" length. 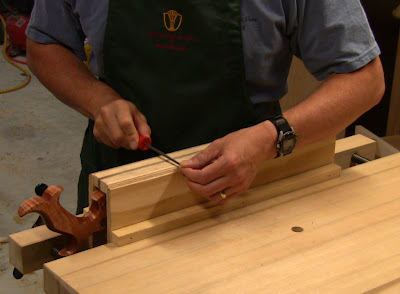 You might find it easier to hold by sawing the shoulders before cutting to length. Sawing down the cheeks of the blade. 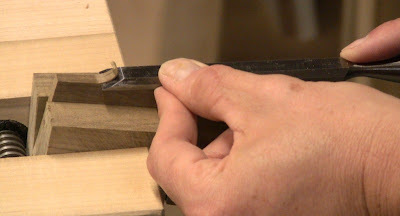 Fine paring of the shoulder, using just one corner of the chisel and proceeding across the width. Using a large slick to pare the cheek. Marking the slope with a cardboard template. To make the template, draw a right triangle 6" tall and 1" wide. Cut the base and slope of the triangle on the line, but cut the template wide so it will span the width of the marker. This makes it easier to hold in place. Mark both sides of both edges of the blade. Rough paring of the waste, down to within about 1/16" of the line. 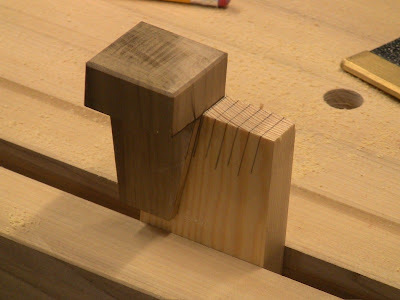 Use the waste blocks as spacers to help clamp it in the vise. Fine paring using a small shoulder plane. 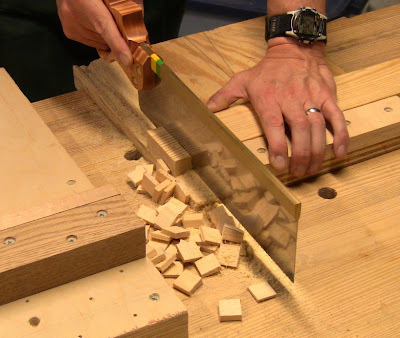 At this point, you want the finest possible shavings, because you're getting close to the line, and you need to establish the cut of the plane along it. Ease on up to it slowly, rushing will only end in tears. The end result. The slope of the blade terminates exactly at the shoulder line. You can see the kind of tiny parings I'm talking about. Repeat for the other side, then check the marker the way you check a square: mark one line on a scrap, then flip the marker and mark a second line next to the first. They should be dead-on parallel. Fine tuning. One side didn't quite match the other by a hair. Ever so slightly, pull the marker down the plane to take a ghost of a shaving, and check it. After tuning, the line on the right from one side of the marker, the line on the left from the other. Now you can trust this marker to mark consistently from either side. Lightly chamfering the top edges and corners to be easy in the hand. Leave all the marking edges sharp and crisp. Time to start sawing. Prepare a piece of 3/4" stock about 3" wide and 12-18" long. Square it all up with good edges. 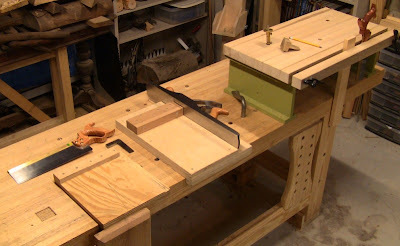 Set up your bench roughly as shown in the first photo above, with a bench hook for crosscutting the end and a shooting board for squaring it precisely. 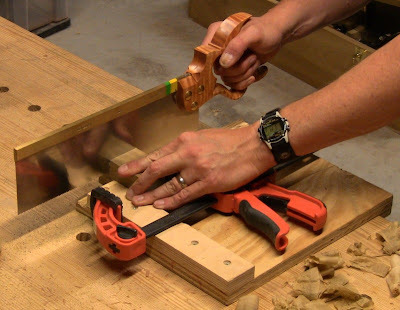 You might want to use a bench-on-bench or Moxon double-screw vise to elevate the work and save your back. 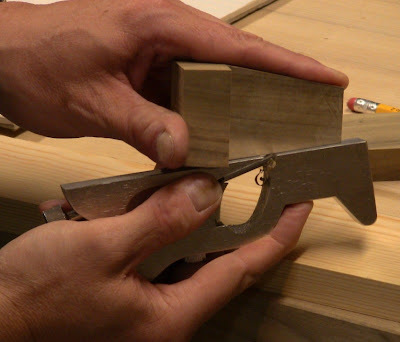 Using a marking gauge set to the thickness of the stock, scribe a baseline across the end on the front and back. Mount the board end-up for cutting. 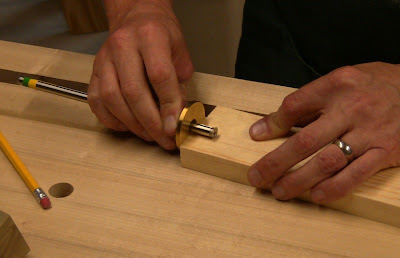 Scribing the end with a cutting gauge. The first set of cuts are marked out with a square. With the square on the end, mark about 10 lines from the end to the baseline, at roughly 1/4" intervals. None of these measurements needs to be precise. What needs to be precise is your square markings. 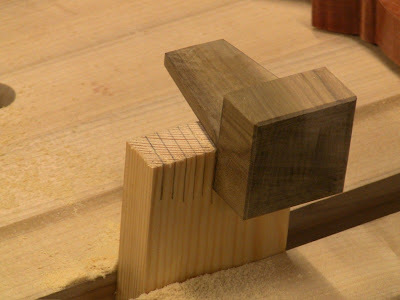 Using the square, carry the lines straight across the end grain, then carry them straight down the other side. You're ready to cut. The square cuts marked out. Make the first cut. You decide how you want to start it and keep it oriented to the lines. Sorting that all out is part of this exercise. How your start the saw, whether you tip it up or not, whether you watch from one side of the saw or the other, how often you check the back, these are all up to you, and you may find it changing as you progress. When the cut is complete, check it front and back. Was it dead on the line both sides? Was it at least parallel to the lines? Or did it skew off at an angle on the front or the back? Did you overcut past the baseline, or stop short of it? 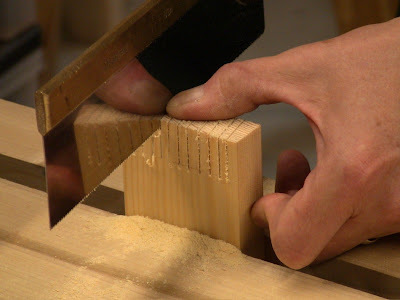 Go down the row and do the remainder of the cuts, each time checking front and back. You should see improvement as your brain works out the details of hand-eye coordination. Front view of the cuts. How did the backs turn out? Are you overgripping the saw? 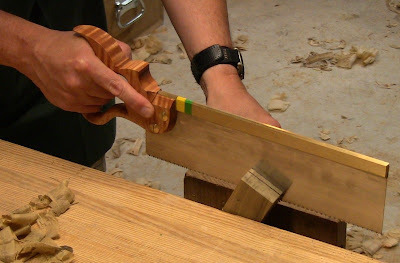 Hold it in a relaxed, almost loose grip, with you index finger extended along the saw. Are you trying to force the cut? Let the weight of the saw provide downward force, and let the teeth do their work. Are you jerking the saw in short strokes? Use steady, smooth strokes for the length of the saw. Are you standing at an awkard angle? Stand so that your arm has clear back and forth motion from you shoulder. It's easy to get all tensed up because you're so focused on doing a good job. You end up with a death grip on the saw and you're trying to jam the teeth all the way through the cut in one stroke. Relax. Smooth, fluid control is what you want. Take a little break every few cuts to loosen up. You'll feel this in your hand before you're done. Just because you saw some guy who's made a thousand dovetails slice through in a second, you're not there yet. But this is working on your thousand. Now that you've done your simple cuts, time to start working on your angled cuts. Each one is a slightly different learning experience. 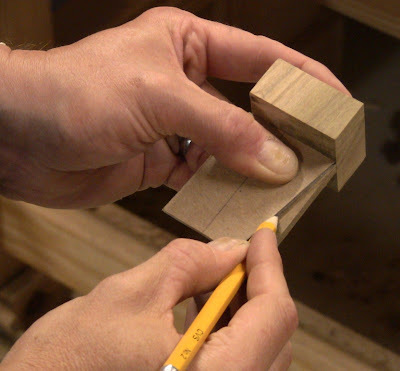 Use your dovetail marker, or set a bevel gauge to a reasonable dovetail angle. 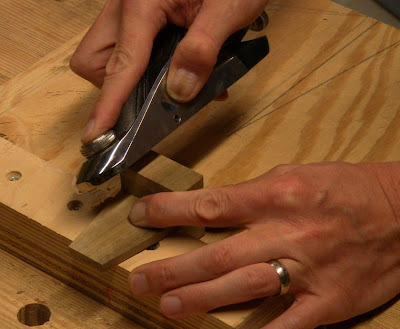 Cut off all those last set of cuts and re-square up the end of the board on your shooting board. The first row cut off. Anyone need blank Scrabble tiles? Scribe your baselines again and mount the board end-up. Mark cut lines at an angle to the left across the endgrain and carry them straight down to the baseline on both sides. The dovetail marker makes it easy to mark both an angled line and a straight line in one position. Marking out the left-angling cuts, viewed from the rear. This is the next-easiest set of cuts, because you're still holding the saw plumb. Make and check these cuts as before. Again, you should expect to see improvement as you go along. Using my thumb to guide the saw as I get it started. Once it gets this far, the cut is committed, and you can't change the angle. 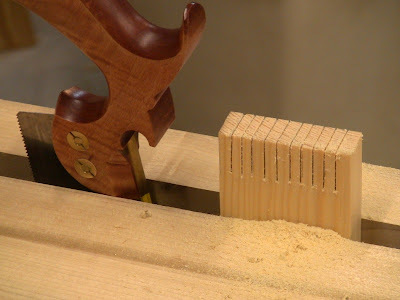 Cut these off, square up the end, and mark it up again the same way, except angling to the right across the endgrain. Cut and check, monitoring your progress. Viewed from the front again, marking out the right-angling cuts. Now we get to the most difficult cuts, where you're holding the saw leaning at an angle. Here gravity starts to fight you as you try to hold the angle throughout the cut. Cut off the last set and square up. Mark angled lines from the end, angling to the left. Carry them straight across the endgrain, then down the back at the matching angle. Marking out the left-leaning cuts. By now you have the benefit of the control you've gained over the last 30 cuts, but these are still a new thing to learn. Cut and check. You may need to hold the saw a bit more firmly to keep it from falling off the proper angle, and starting and sighting along the line will be a bit different. When you've done these, cut them off, prepare the board, and mark them the same way, but angled to the right. When you finish these cuts, you'll have done a total of 50. Marking out the right-leaning cuts. Forty pieces on the bench, cutting off the last 10. Ready for more? Do it all over again! That's 100 cuts. By the end of this, your back and shoulders may be complaining, and your eyes may be crossing. If you haven't stopped before this, stop now. At some point fatigue outweighs the benefits of practice. Repeat this a few times over the next several months. Once you're satisfied with the results and don't need to do any more, it's still worth taking a few practice cuts like this every so often to maintain the skill. Many people recommend it as a quick warmup before cutting into a real workpiece. I've been planning to do this soon as part of my "rebooting" from a blank slate and learning again from the ground up. Neat to see your detailed take on the process. 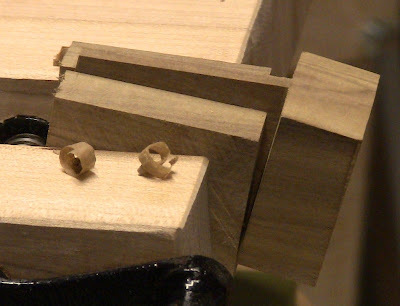 I plan to also do dovetail month (a joint a day).